Having public transit navigation and information added to Apple Maps in iOS has been rumored for a long time. The feature was intentionally left out of iOS 6, but Apple allowed 3rd party apps to hook in and provide that data. It was iOS 8 that was really supposed to get the feature, but it wasn't quite ready for the September release; and, since Apple can't update most of its individual apps outside of a system-wide update, that means iOS users have to wait until next fall. And, it looks like iOS 9 will finally be the update to bring public transit to Apple Maps; at least, that's how it appears based on a newly filed patent. The patent by Apple is called "User Interface Tools for Commute Assistant", and it details an "assistant" that would help guide you on public transit either within a city or even between regions. The assistant would provide estimated arrival times, station and stop information, automatic updates, and more. We're unclear why the USPTO has found this filing worthy of a patent given the long list of prior art in this case, not the least of which is Google Maps; but, at this point, we've given up trying to make sense of the mess that is the US Patent and Trademark Office, and the massive failures it has had trying to deal with software patents. I don't and never use public transit (just fortunate I guess, not that it's wrong to do or anything). So I was happy that we got a new map app that does not include that button - lack of redundancies is the reason I use iOS. One of huge reasons I liked the new Apple maps (no, I had no issues with Apple maps ever). I just hope if the add this, I can disable or hide the option. Apple Maps has come a long way. It has, but it has a long way to go, too. They're trying to patent something Google Maps already has. You can't patent something that has already been patented, it's called prior art. But I guess that won't stop Apple. Apple maps may have come a long way, but Apple is still the same as always. If Google has a patent on it, then yes. But prior art doesn't matter anymore since the US went to first to file. Prior art still matters no matter what, nothing has changed about that. In the US you have one year from public disclosure to file. If you don't, you lose the right to patent, and there is no prior art. You just contradicted yourself buddy. If you invented something, you have a 12 month grace period to patent it BEFORE that itself becomes the prior art. You can't go around advertising a new invention and expect protection a year later. This has been the policy, forever. Unless you are in Germany and you have no grace period as apple found out. Also, Google Maps is an app, not part of Android. That could be their trick, as they're patenting it being a core part of the OS. It's too bad you can only get updates on the software once a year. I didn't even know that until I read this article. "We're unclear why the USPTO has found this filing worthy of a patent given the long list of prior art in this case, not the least of which is Google Maps" This isn't a patent - it is an application for a patent. That being said, this is business as normal for apple and just about everyone else. Navigon, HERE, Google already have this implemented already for some time now. I'm sure apple is very aware of this, so why try to patent the wheel??? patent troll. never thinking of innovating. just planning on trolling. So iPhone users cannot delete Apple Maps if they want to use a 3rd party application because it's part of the OS? LOL. I guess they're following in Microsoft's footsteps with their claim that Internet Explorer was a part of the OS thus cannot be removed. Um. You can use third party maps or any app for that matter. 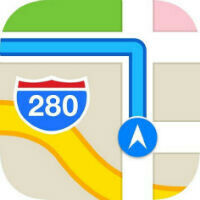 I just prefer Apple maps, some prefer Google maps, some other map apps - we have the best of both worlds. I'm not saying that you can't use third party apps, I just think it's odd that they designed Apple Maps into the OS so that they can only update it with full system updates. Google updates it's Maps app all the time. What Apple's doing seems a bit counter productive. I replied to your post but in wrong area - see post #20 But to add to that: I don't think you're using the term counter productive correctly. I know you're trying. To paint it as a negative thing, but even if Apple didn't update maps but only once a year - how is that counterproductive or a negative thing? It's not like we have to wait a whole year to use maps - they worked really good from day one here in California. I have not need to install Google maps (as I hate the layout and the addition of public transit that I don't use). Not to sound like a fake troll but I had issues with Google maps when it was preinstalled on my 3GS - it wasn't as accurate as fandroids make it out to be. Today it's no more accurate than Apple maps anyway. Well, seeing as I have never used Apple Maps, I cannot attest to whether is it more or less accurate than Google. I can say that I submitted update requests to Google Maps where certain items/businesses were not where Google was showing them, and had them fixed within a month or two, whereas Apple Maps has received criticism for taking over a year and a half with still no action on such requests. http://www.phonearena.com/news/Apple-Maps-keeps-sending-skiers-to-grannys-house_id53301 I do understand that the map updates are not the same as the application updates that is discussed in the article. I will also go ahead and state that just two weeks ago I had an issue where Google Maps directed me to a point two streets away from my destination. I know that both are great apps, and both are still not perfect, but one has given me the impression that it services its customers much better than the other. Maybe things have changed in the 9 months that article I cited was posted, I certainly cannot say for sure as I depend on media to report things on Apple maps, but in case things haven't changed then I'm sorry that Apple isn't pushing this service to be at the same standards as Google's services. Edit : this is a reply to post #19. I started typing in wrong area instead of reply. No if there's an update specifically maps, or iMessage, or camera,etc they'll release it mid year. But also don't forget we get Google map updates too - sometimes before android phones, and even sometimes iOS version is better. With iOS we have a choice whether we want to use google services or Apple services - there's no compromise.